The euro vs dollar continues to struggle to break and hold above the USD1.40 psychological level and in the last two weeks of trading we have seen three shooting star candles which have all hinted at short term weakness. With yesterday’s narrow spread down candle confirming the most recent of these which occurred on Monday. 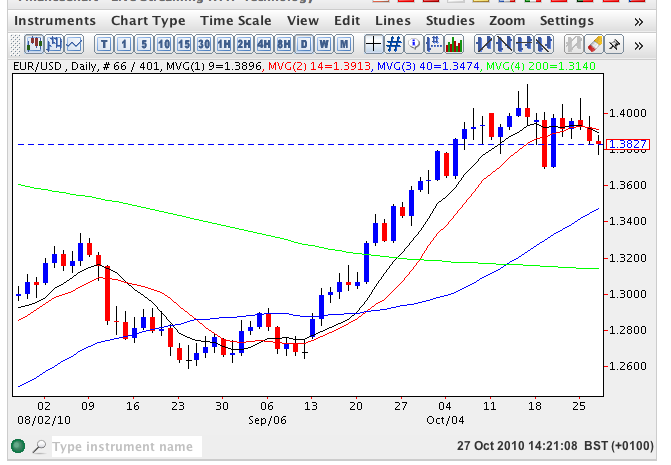 Yesterday’s price action also closed below both the 9 and 14 day moving averages which have now crossed with the 9 day in particular appearing to offer some resistance as we trade at USD1.3820. We are now delicately poised at a critical point for several reasons: first is the imminent FED announcement on 3rd November when the markets expect details of the QE2 rollout programme and in the run up to this we are likely to see a combination of nervous and volatile trading as the markets react to rumour and speculation, making any trading extremely tricky. Second, the current climate is also having an adverse effect on some of the leading currency pairs, such as the aud usd, and should this fail to breach parity, which seems highly probably at this stage, then this could trigger a sharp sell off and take the euro down with it. Finally the usd chf which under normal circumstances provides a perfect inverse correlation for the eur usd, appears to have risen from the dead to break and hold above the 40 day moving average. Finally in yesterday’s forex trading session we also a strong sell off of the euro against the British Pound which, if confirmed this week, would leave us with bearish engulfing signal on the weekly chart. In summary the markets now wait for the meeting next Wednesday and between now and then we are likely to see further consolidation, volatile price action and uncertainty which will only be quashed once the FED has delivered its long awaited statement of intent. Today’s fundamental news for the euro vs dollar has included core durable goods in the US which came in far worse than expected at -0.8% against a forecast of 0.4% and later today we have the crude oil inventories which are forecast to show a build of 1.1m. Tomorrow we have the weekly unemployment claims in the US, followed by advance GDP and this is the first of a trio of GDP numbers is the most significant. The forecast for a figure of 2.1% against a previous of 1.7% and should this number come in below expectation will give us a strong clue as to the FED’s QE2 intentions.